Summary: Electric circuits: Learn how to wire a ring main circuit, wire a radial circuit and wire a lighting circuit. To supply power to plugs, appliances, and fused connection units (FCUs), a circuit must connect these power outlets to miniature circuit breakers (MCBs) in the consumer unit or fuse box, where the mains electricity supply runs into. 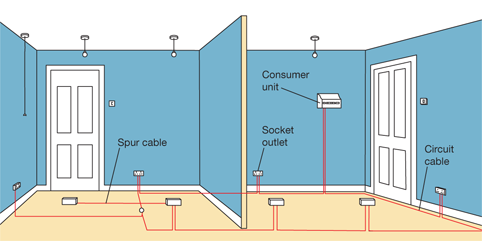 Spur cables can also be run from each outlet on the circuit to supply a double socket or FCU. A cable runs from the consumer unit to each socket in turn before returning to the consumer unit. Electricity can flow in both directions around the circuit, which is protected by a 30 or 32amp fuse or MCB. It can accommodate a large number of sockets or FCUs as long as the maximum load does not exceed around 7,000 watts. If you wish to run a new circuit off a ring main circuit, the total floor area around which the circuit runs must not exceed 100sq m (1,075sq ft). A cable runs from the consumer unit or fuse box to each socket in turn and terminates without returning to the consumer unit. This allows for an unlimited number of sockets to be connected to the circuit and is why the radial circuit is used in wiring long buildings. Lighting is wired in radial circuits. There are two methods of wiring: Loop-in wiring is the most common with a cable connecting each ceiling rose in turn. The cable is connected to one of the 3 rose terminals. The other 2 terminals are for the switch cable and the light fitting or lamp flex. 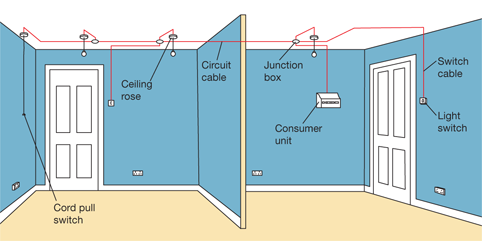 Junction-box wiring is used to extend a circuit. 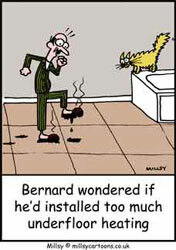 Cable runs from the consumer unit to a junction box. From the junction box, a separate cable runs to the rose and another one to the switch. You could use separate junction boxes or a single junction box with numerous terminals.